City and date for your first personal session with Master John (1 of 2). Each session must be in a different city. City and date for your second personal session with Master John (2 of 2). Each session must be in a different city. I understand and acknowledge that healing at CMA International events is performed by God and the Master Angels and not by any individual or affiliate of CMA International or the Church of the Master Angels. These events are not substitutes for prudent medical care offered by licensed medical professionals. We are excited to offer Golden Passes to the wonderful, devoted souls who travel around the country to honor the Master Angels! For those of you who are wishing to attend every event on a tour, we have created a simpler registration process to enable a smoother experience. A Golden Pass includes two reserved personal sessions with Master John, a seat at all other events on the tour, and dial-in codes for events that are not attended in-person. Each Golden Pass Holder receives two bonus Silent Faith Remote Healing requests and one bonus Karmic Mitigation Blessing. Each Golden Pass Holder automatically receives one Karmic Mitigation Blessing upon registration. This Karmic Mitigation Blessing is for you, the Golden Pass Holder. All Silent Faith Remote Healing requests are intended for you, the Golden Pass Holder. Reserved personal sessions are available to Golden Pass holders only. They are based on main concerns filled out at the time of registration. Healing starts as soon as the registration is completed. Faith is what bridges the gap between a person’s karmic debt and their opportunity to be healed. Please note that tour events may change. Passes are not transferable or exchangeable. In-person attendees will also have the opportunity to purchase one extra Silent Faith Remote Healing for $175 at each event for themselves or others. 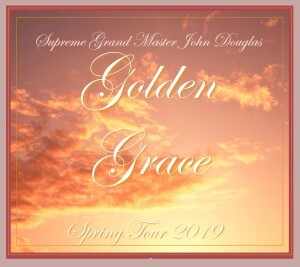 We look forward to sharing the Spring 2019 Golden Grace Tour with you!